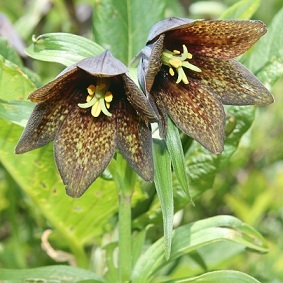 This species of fritillary is native to western North America from Alaska to Oregon, also northeastern Asia. It's tuberous roots are starchy, somewhat like a potato. Grizzly bears find them tasty and will dig them where possible. They have been used similarly to Wapato by Native Peoples for centuries. In fact, this year the nations in the western coast of British Columbia have begun to use this plant for food value, bringing back the food of the ancestors. 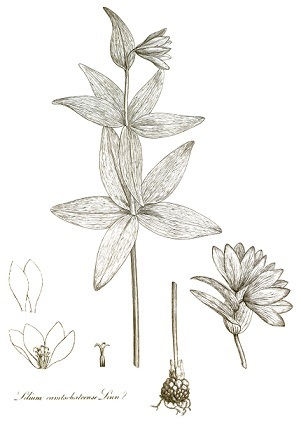 General Description: A perennial that herb lives in a bulbuous cluster of several larger scales much like garlic but with many small bulblets around them reminiscent of rice grains. The strong stems appear first about 8 to 24 inches long with leaves in a circular pattern about the stems, usually 1 to 3 circlets, each group has 5 to 11 leaves and then a few leaves seemingly randomly placed above the top leaf coil. The leaves are lanceolate, from 1 2/3 to 4 inches across. Flowering from May to July, there may be 1 to 8 dark brown/purple to greenish brown flowers at the top of the stems, often with yellowish streaks or spots and bear a very nasty scent. 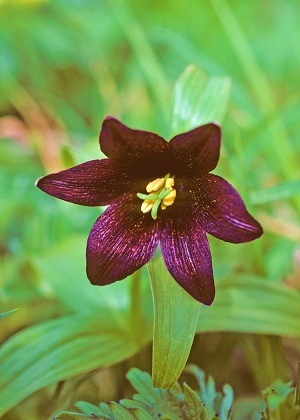 This plant may be differentiated from other Fritillarys by bloom detail. Coloration of the bloom is quite similar to F. atropurpurea and F. lanceolata. Range: Find this native perennial in Alaska's Kodiak Island down through Vancouver Island to British Columbia and southern coastal Washington where they have been seen in Snohomish, King, and Whatcom counties and rarely on Camano Island in Island County. In years past they are reportedly seen in San Juan County. Habitat: This plant likes to be close to bodies of water from lakes and streams to damp meadows, different types of marshes, and bogs, either in shady evergreen wetlands to deciduous areas as long as there is plentiful moisture from near tide flats to mountain meadows. This assortment of suitable environs gives this lily a better chance of survival than do other, more picky natives. Classed as "sensitive" in Washington, current threats include timber harvest, trampling, hydrologic changes, and collecting. NOTE: On June 1, 2012, the 2012 National Wetland Plant List superseded the information below (see Federal Register, May 9, 2012, 77(90): 27210-27214[https://federalregister.gov/a/2012-11176]). For updated wetland information about this species, see the latest wetland list. Burke Museum of Natural History and Culture, www.biology.burke.washington.edu/herbarium/imagecollection.php?Genus=Fritillaria&Species=camschatcensis. See the exquisite photograph by Jim Riley on this page from Burke.